Collaboration across health care payers and providers? It’s easy to preach—and hard to do. Where do you start? How do you build consensus? How do you work together and not compete? Now, in some health care markets around the nation, public and private payers are considering ways to align their work with providers to deliver more efficient, higher quality care. 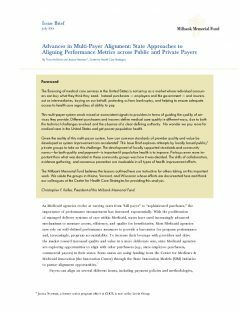 An Issue Brief by the Center for Health Care Strategies, with support from the Milbank Memorial Fund, explores options for synchronizing quality measurement agendas across public and private payers and providers. These efforts are beginning to receive attention from states pursuing State Innovation Models under the Center for Medicare & Medicaid Innovation. This Issue Brief draws from the innovative efforts of three states—Maine, Vermont, and Wisconsin—as they outline strategies for multi-payer alignment. Their insights about coordinating quality measures can inform efforts of payer alignment in other activities as well.